Keeping up to date on the changing laws and responsibilities of structured settlements can be a difficult task unless that’s your focus and area of expertise. That’s where The Finn Financial Group comes in. Helping you meet your due diligence obligation to your client by having independent verification of structured settlement terms offered. Performing present value analysis of damages. 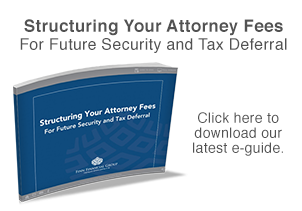 Helping determine the appropriateness of a structured settlement for your client. Assisting with plan design and life insurance company selection. Conducting seminars for law firms or bar associations. Structuring attorney fees where applicable. There is never any charge or out-of-pocket expense to you or your client. We get paid by the annuity company if and when your client chooses a structured settlement and we are involved. To find out how we can help you and your client, contact us today.